Iliopsoas bursitis can be as scary as it sounds when it comes to the painful symptoms and possible partial loss of mobility. More permanent damage can result with the overuse of joints. We depend on the strength and the condition of the cushioning of our joints for ease of movement and flexibility. Also known as iliopectineal bursitis, this form of bursitis may be treated and resolved with natural remedies and iliopsoas bursitis exercise. The inner hip muscles are known as iliopsoas, and the inflammation of the bursa is bursitis. We will be discussing the causes and symptoms that differentiate this from other conditions. When the bursa feels the brunt of continuous repetitive actions, it can become inflamed and cause pain. This condition is noticeable in athletes and avid runners. Initially caused by a repetitive motion as seen in sports such as running, iliopsoas bursitis flares up with the overworked and excessive use of the hip joints. Iliopsoas bursitis symptoms need to be carefully examined and monitored as they are often mistaken for those of iliopsoas tendonitis and hip joint arthritis. Most of the symptoms are present at or near the hip region, with some in neighboring areas of the lower torso. 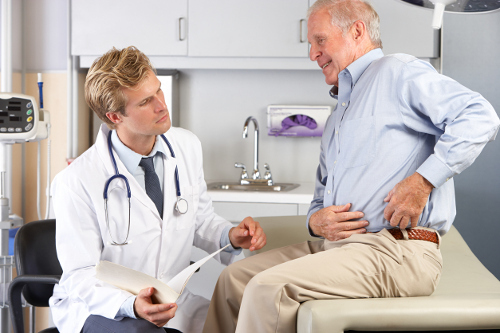 The symptoms experienced, the severity of the injury or condition, and the existing health condition of the patient will determine what type of iliopsoas bursitis treatment they will receive. For most common symptoms, there are natural treatments such as rest to avoid further complications or damage to the area. You can use an ice compress to alleviate the inflammation and pain. Also, to avoid bearing weight on the affected hip, use a cane or walker when needed. Physical therapy can help to ensure the correct exercises are being applied to strengthen and maintain use of affected areas. You can try techniques such as stretches, simple exercise movements, soft tissue massage, electrotherapy, and joint mobilization. Lower the affected leg to the floor with the portion from the knee to the foot lying directly on the floor. Bend the other knee forward to obtain a painless stretch of the thigh. Hold for 30 seconds and repeat three times. On the floor, lie on your back and stretch out the affected leg on the floor while placing the opposite foot flat on the floor with your knee bent. Tense up the thigh muscles as the affected leg is raised to the height of the opposite thigh and hold for one second. Repeat this 10 times on each side. Sit on a chair with the right knee bent and raise said knee in the air without experiencing a painful stretch. Hold for one second and repeat with both legs 10 times. With the use of a rubber resistance exercise band, tie the ends together in a circle. Place one end under the leg of a sturdy furniture piece and slip your foot in other end, so your body is on the outside of the band. Slowly move the foot forward with three sets of 10 repetitions. On the floor, lie on your back and pull the affected leg towards the opposite shoulder. Hold for 15 seconds and repeat four times. The stretch should be pain-free and felt in front of the hip or buttocks. Iliopsoas bursitis can be a debilitating condition for some, as it may rob a person of their mobility freedom from the pain. In addition to joint inflammation, any underlying cause should be addressed in treatment as well. The significance of noting the symptoms is to distinguish from other conditions. There are natural remedies such as iliopsoas bursitis stretches and exercises to help regain flexibility and mobility, as well as to strengthen the affected area. Kerkar, P., “Iliopsoas Bursitis or Iliopectineal Bursitis: Causes, Symptoms, Treatment, Exercises,” ePain Assist, August 4, 2016; https://www.epainassist.com/sports-injuries/hip-injuries/what-is-iliopsoas-bursitis, last accessed May 1, 2017. “Iliopsoas Bursitis,” Sports Injury Clinic; http://www.sportsinjuryclinic.net/sport-injuries/hip-groin-pain/groin-pain/iliopsoas-bursitis, last accessed May 1, 2017.